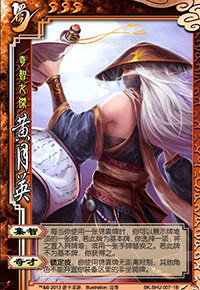 Whenever Huang Yue Ying uses a tool card, she may flip the top card of the deck. If it is not a basic card, she puts it into her hand. If it is a basic, she may exchange it for any card in her hand. Then it is discarded. Huang Yue Ying's tool cards have no distance limitations. Other players cannot remove Huang Yue Ying's armor unless they are within range to her. "Wisdom" is optional to perform. She does not have to show the top cards, nor does she need to exchange for the basic cards. "Talent" is the same as regular Huang Yue Ying with added features. 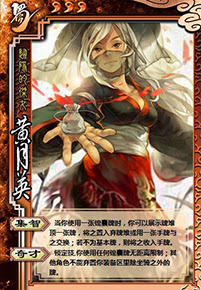 For "Talent", to get rid of Huang Yue Ying's armor, a player must be able to reach her. What this means is that other people's Breaks are limited reach like Steals to her armor. 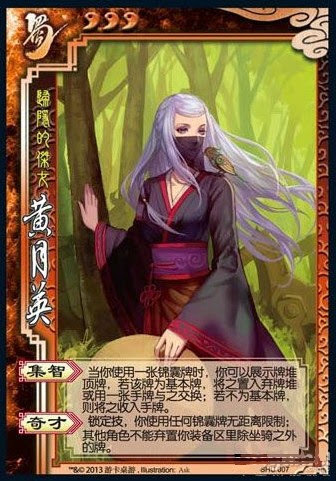 Her hand cards, horses, and weapons are not protected with "Talent".